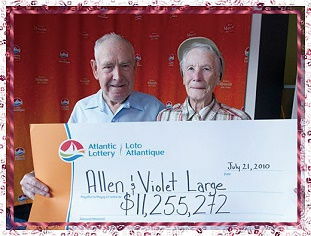 In July, 2010, when Allen and Violet Large, a retired couple from Nova Scotia, discovered they had won almost CAN$11.3 million in a lottery, they decided to keep two percent of the money and donate the rest to over 70 organizations, including churches, the Red Cross, the Salvation Army, animal protection agencies, fire departments, and hospitals particularly those in Truro and Halifax where Violet received cancer treatments. They also gave large, equal-sized gifts to each of their 15 family members. 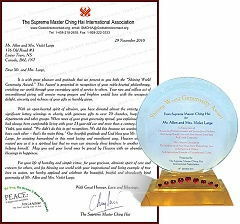 Upon receiving the large parcel containing the Award plaque and other gifts in the mail, the couple expressed sincere appreciation and thanks to Master. “It made us feel good.” Violet said and she added that they have read one of Master’s books about the dogs and thought it is very beautiful. We join Master in wishing that Mr. Allen and Mrs. Violet Large be graced by Heaven with an abundance of blessing in happiness. We thank them for assisting humankind in this most loving and magnificent way.